yesterday i turned thirty-one! i seriously LOVE birthdays. it's so fun to have an entire day just focused on you...and that is exactly what i was given. kevin took the day off and spoiled me all...day...long. my parents watched the kids while kevin and i went to the temple. i can't think of a better way to start my birthday than with my husband in the temple we were married at nearly seven years ago. i tell ya what, by the end of the day i was feeling VERY loved and spoiled. i am so thankful for great family and friends. this is kindof a "where's waldo?" picture. can you spot all the kids? well, we had so much fun at the pumpkin patch the first time we thought we would try it again. this time we were in the company of family. my parents had emily and brandon visiting from utah and they also had jarom and elena's kids while they were in vegas. good times had by all! and we had to leave with a couple more pumpkins. alyssa and halle scaling the pumpkins to find just the perfect ones for grandma. sometimes it's not easy to get a good picture, especially when i am in it (least photogenic person in america). so natalie had to take quite a few. in the process she got this candid picture of me and my mommy. love it! we didn't get home until after midnight and i was so happy to sleep in my bed and see my boys (all three of them)! thanks to all the help we had to make this get-away happen (my neighbor brenda, kevin's sister and her husband staci & kyle, and KEVIN)! i can't wait to see what amber has in store next time! p.s. 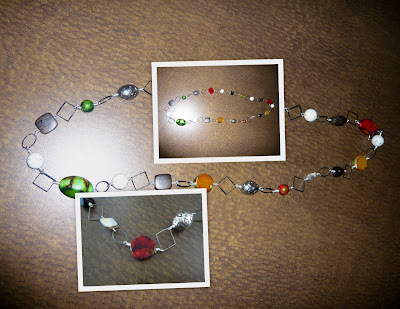 here is a peek at the necklace i made. speaking of naps, aunt elena had just the right touch and assisted in madalyn getting a short snooze. we couldn't take strollers in and out of the stores so we decided to just carry her around. i think next time i would rather stay outside with the stroller in shifts...madalyn was not loving it. we had dinner at a restaurant in gardner village. food was so-so, and the service was TERRIBLE! oh well. it was still fun to sit and visit. aren't you loving all of our new, handmade necklaces! fun, fun, fun! sister sneak 2009 has come and gone. it always goes WAY TOO FAST! katie took the reigns this year and planned a fun weekend for all of the ladies. it's seems nearly impossible to find a weekend when all the women can get away but we succeeded and we had a great time. we arrived in logan, ut just before 7 pm. katie had a class reserved just for the nine of us at a local bead shop. we had the whole place to ourselves (plus the instructors) and had pizza, soda, salad and learned how to wire wrap. we made our very own necklaces link by link. pretty cool! 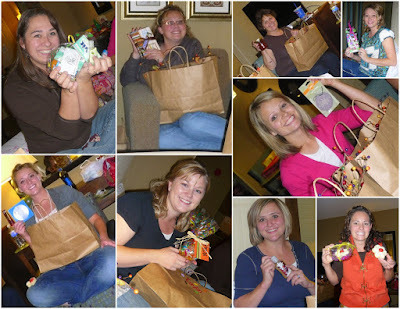 around 9pm we packed up and moved the party to our hotel rooms (we stayed at the new holiday inn express that night) and got right down to business...opening our "favorite things" grab bags. SO FUN! mom was in charge of putting the cute little bags together and did such a fantastic job. she went all out with vinyl art and used an adorable garland as the "tissue paper". elena gave "three essentials every purse needs". gum, lip balm, and antibacterial hand gel. katie gave a monogrammed journal, pen, and candy bar. mom gave a jar of her homemade chili sauce and a halloween sit-about. emily gave bobby pins and a super nice nail file. amber gave scensty car candles and portable tins and brought a grab bag of estee lauder loot. natalie made us each a cd of the songs that inspire her. kaylin made us all carmel apples. melissa brought some HUGE delectable sugar cookies. we actually went to bed kind of early (that tends to happen when sleeping-in is a rare treat) and when we woke up it was back to the bead store to finish our projects. afterward we started our drive to gardner village in west jordan, making a pit-stop in brigham city for lunch. we spent the rest of the day in gardner village visiting all the way-too-cute shops. madalyn was also with us during this sneak and was such an angel...until gardner village. she was so ready for an undisturbed nap. poor thing! but, she was a pretty good sport. all the anticipation for halloween is just KILLING owen. he has been practicing his jack-o-lantern face on paper for the last week. so, when we finally brought pumpkins home from the pumpkin patch the other day he couldn't help take his pen to them (while i wasn't looking...of course)! on thursday, owen's preschool went to the pumpkin patch! owen and wesley were so excited about this ALL WEEK LONG! they were quick to put claims on their pumpkins...and changed their mind every time they turned around. they also had a great slide there that the kids could play on inside a "hay maze". so fun! on wednesday, owen's preschool went to a local gym to play around for the afternoon. they will be doing this each month. owen had a great time! wesley was wishing that he could be down there jumping around! he will get his chance when he's four. our wesley is a pretty good eater, a messy eater, but good. he usually tears each meal apart and eats it layer by layer. such a clown! he also is pretty good at falling asleep mid-bite. this chip didn't quite make it to his mouth. let's be honest...there are a lot of frustrations that come with kids. but, there are also times when you just can't get enough of them. owen asked me to take some pictures of him holding madalyn. i told them to smile and this is what i got. it actually looks like he got her to smile! crazy kids! wesley LOVES stickers and will go through a WHOLE sheet of stickers in minutes. he loves to stick them all over his face and clothes. it's so fun to watch. and he really doesn't think there is anything funny about it. this is serious work! wesley is our little cuddle bug. he sneaks into our room around 4 or 5 in the morning at least 4 nights at out of the week. we have a hard time saying no to him because he is so fun to cuddle with.